The iPad writing experience (tribute to Steve Jobs) – D.O. Back in the old days I didn’t join the Apple fan club. I didn’t like its “elite aura”. Besides, in the 80’s and 90’s I was too young and poor to afford Apple prices. But, for me, everything changed with the “I” revolution. In the 00’s, iPod, iPhone and iPad won me over, and now I couldn’t imagine a single day in my life without using them. What I do most of the time is writing (in italian, because I’m italian). 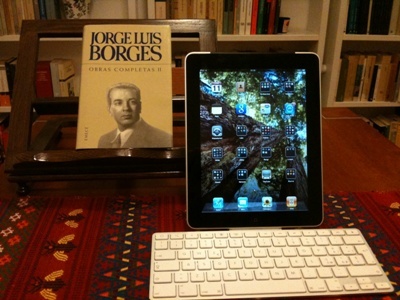 So here’s my humble homage to Steve Jobs: a post about writing with the iPad. Rating: you can do it. Fiction á la J.M. Coetzee and short stories á la Tobias Wolff could be written on the tablet. When necessary documentation has already been collected in an earlier stage and you “only” have to write or rewrite, maybe during a trip or just far from home, the iPad is what you need. Moreover, lying on the bed typing sentences on a tablet that rests on your thighs can trigger a creative pleasure so much different either from the computer or the pen experience. Do not forget (1) an application for synonyms and also a dictionary app. When you have them, you have simplified and centralized your work. It’s all in there, you just have to invent. Do not forget (2) to sync. Rating: not completely useful. The amount of files you have collected, not to mention the mental maps and preparatory work, can be unmanageable on the pad. No matter how hard you try, you’ll stand in front of a wall with no doors or windows. A jail. Useful just to write short pieces meant to be moved on other devices. Or for a final editing. But you still need the big one: daddy computer. Rating: excellent. For the endangered species that needs only to write and send to a desk for an “ink and paper task”, the iPad is perfect. All you need is Pages or another editor. Look no further. You can also listen to your recorded interviews writing them simultaneously in multitasking. Then just press “enter” in the mail button and that’s it. Rating: good. Bloggers use cms too. But they face less editing problems. And they can use the platform they like. So just choose WordPress or something similar, and you may receive rewarding sensations from the iPad. Rating: excellent. The perfect marriage. The editor’s opaque page and the elegant frame of a quiet tablet are ideal for a rarefied verse, large spacing and lots of new paragraphs. The mouse is gone, i.e. the most unpoetic device connected to digital life, and that also contributes to style. The ivory blank spaces, eying the author, do enhance the intensity of his text. Etc. et. etc. Rating: see poet. You need a reliable companion, always ready to pick sudden and vivid manifestations of thought. A notepad. Which is, in our times, the tablet. Rating: not very useful. Add the lack of a bibliographical apparatus to the problems mentioned above (see Writer, author of complex and postmodern novels). As far as I know, no app allows the amount of footnotes a scholar needs to write. The iPad is too limited for that. Rating: N/A. Scientific work is a team work, isn’t it? So you need a WePad. The iPad is not enough. Rating: perfect. Great for giving and writing speeches, editing press releases and then sharing them in social networks. Sync with your ghostwriter on Dropbox: you’ll always have at hand the latest version of the text you need. Rating: see politician. But if you write for more than one client, be careful not to sync the wrong files or directories 😉 . You have remarked very interesting details ! ps decent web site . “Choose your friends carefully. Your enemies will choose you.” by Yassir Arafat. website has a lot of exclusive content I’ve either created myself or outsourced but it appears a lot of it is popping it up all over the web without my agreement. Do you know any techniques to help prevent content from being stolen? I’d genuinely appreciate it. I don’t know. It’s not that easy. Trademarks for pictures?